Diagrams and movies of all the 4 authorization flows defined in RFC 6749 (The OAuth 2.0 Authorization Framework) and one more flow to re-issue an access token using a refresh token. This is the flow defined in RFC 6749, 4.1. Authorization Code Grant. 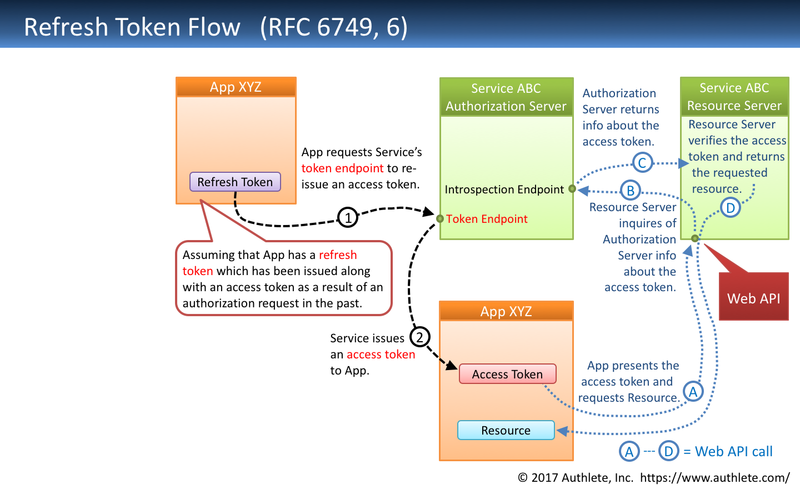 A client application (a) makes an authorization request to an authorization endpoint, (b) receives a short-lived authorization code, (c) makes a token request to a token endpoint with the authorization code, and (d) gets an access token. Note: The snippet above contains request parameters from RFC 7636 in addition to ones from RFC 6749. See PKCE Authorization Request for details. Note: The snippet above contains request parameters from RFC 7636 in addition to ones from RFC 6749. See PKCE Token Request for details. This is the flow defined in RFC 6749, 4.2. Implicit Grant. 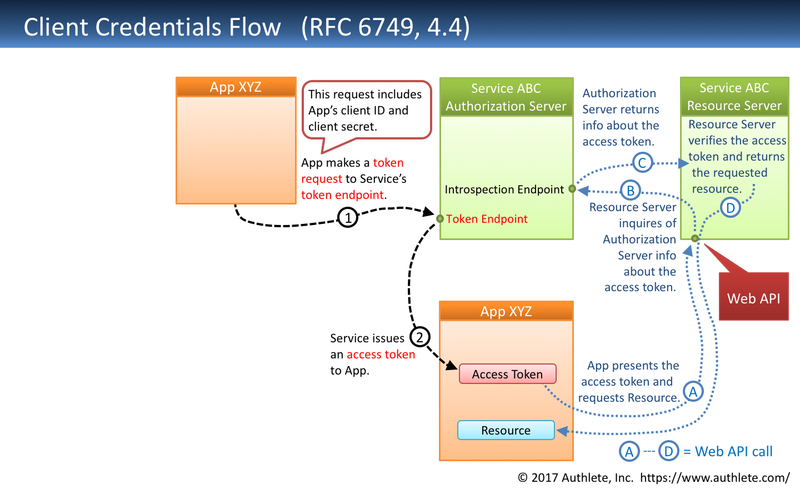 A client application (a) makes an authorization request to an authorization endpoint and (b) gets an access token directly from the authorization endpoint. Implicit Flow does not issue refresh tokens. This is the flow defined in RFC 6749, 4.3. Resource Owner Password Credentials Grant. A client application (a) makes a token request to a token endpoint and (b) gets an access token. 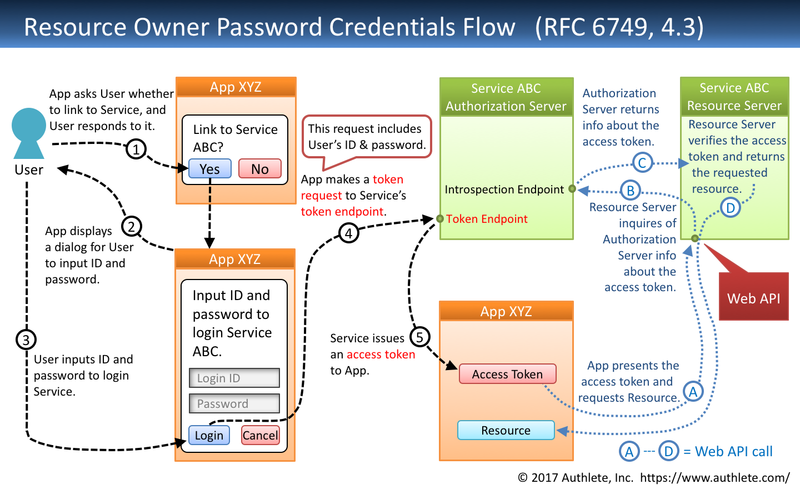 In this flow, a client application accepts a user's ID and password although the primary purpose of OAuth 2.0 is to give limited permissions to a client application WITHOUT revealing the user's credentials to the client application. This is the flow defined in RFC 6749, 4.4. Client Credentials Grant. A client application (a) makes a token request to a token endpoint and (b) gets an access token. In this flow, user authentication is not performed and client application authentication only is performed. The specification says Client Credentials Flow should not issue refresh tokens. This is the flow defined in RFC 6749, 6. Refreshing an Access Token. A client application (a) presents a refresh token to a token endpoint and (b) gets a new access token. “Semi-hosted service pattern” is a new architecture of OAuth 2.0 and OpenID Connect implementation. In the pattern, a frontend server (an authorization server and an OpenID provider) utilizes a backend service which provides APIs to help the frontend server implement OAuth 2.0 and OpenID Connect. Authlete is a real-world example of such backend services. The figure below illustrates the relationship between a frontend server and a backend service (Authlete). The primary advantage of this architecture is in that the core part of OAuth 2.0 and OpenID Connect implementation is clearly separated from other technical components such as identity management, user authentication, login session management, API management and fraud detection. 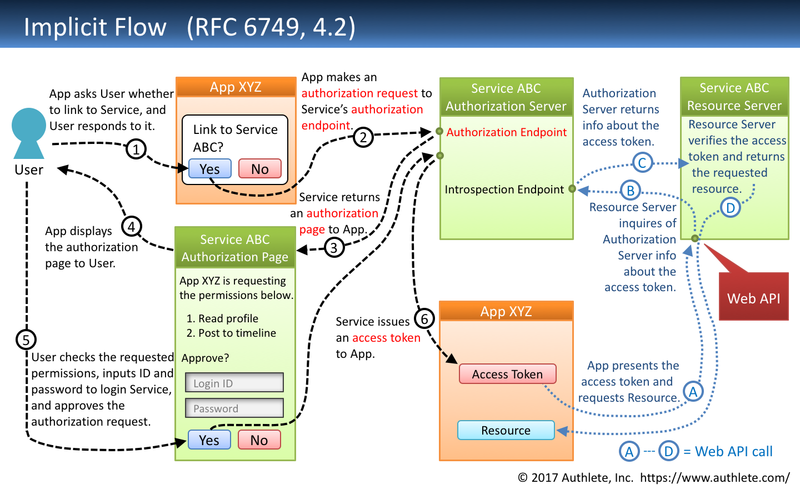 For example, the following diagram illustrates how user authentication is separated from OAuth 2.0 implementation. 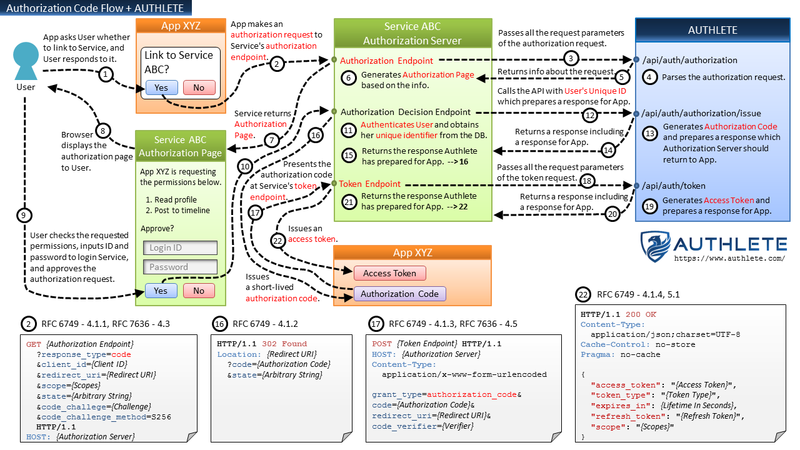 Please read “New Architecture of OAuth 2.0 and OpenID Connect Implementation” for details about the semi-hosted service pattern and its architectural advantages.